Organization of information is how that information is displayed and how readers/viewers interpret the information that is portrayed. Proximity refers to how text or a group of texts are arranged. "How that information and that empty space is configured makes it easier or more difficult to see relationships and to understand the information" (119). So how a text is arranged can affect how the reader/viewer interprets or understands that information. 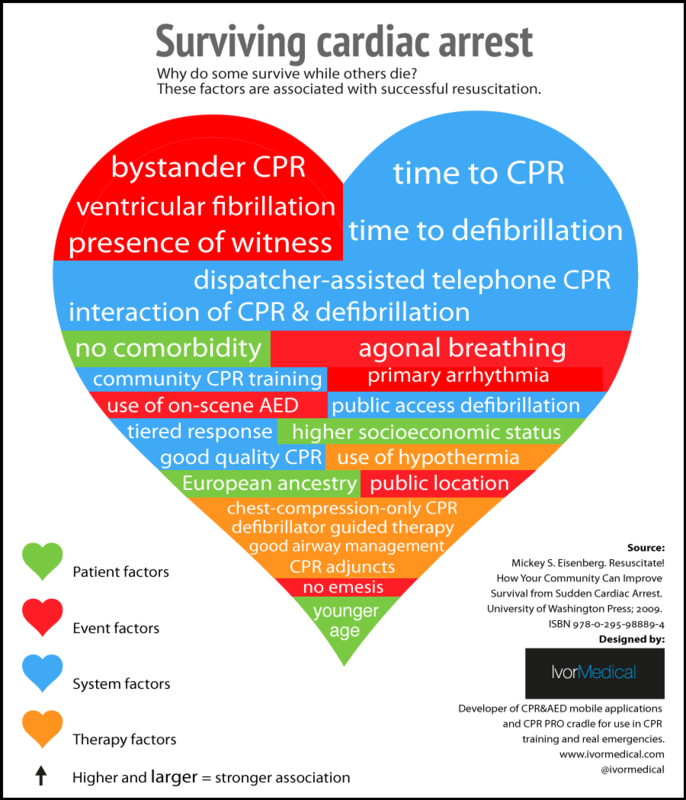 This infographic of how to survive cardiac arrest. This image uses a hierarchy of sorts. At the bottom left hand corner there is a note that say higher and larger = stronger association. So the higher and larger the information is the more important it is. If there wasn't the note in bottom left corner the reader would not make the connection. Since the graphic is in the shape of a heart the reader must assume that the text that is at the bottom of the heart was made smaller to accommodate the small space. Shouldn't something that is organized in a hierarchy be self-explanatory. One should be able to tell what piece of information is more important. Hmm, interesting, all of the boxes are the same size. Usually with some kind of hierarchical data set (like one of those word graphs magazines use sometimes) use bigger font sizes to convey the importance of one word (or heart condition) vs. another. Maybe they just ran out of space? This definitely could be done better. How the text is arranged will undoubtedly affect how the audience interprets and understands information. As the visual creator, it's important to pretend you are someone who has no idea what you're talking about. So, placement of information is key in helping the audience understand the relationships between the data and other information.